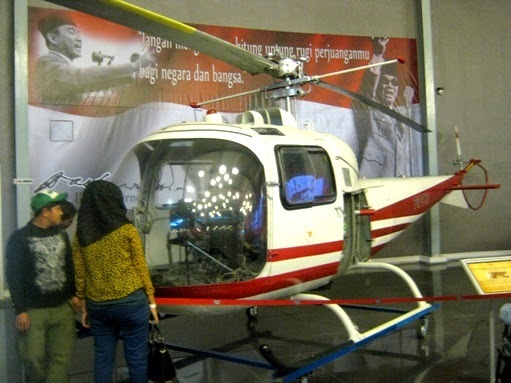 The replica of the first helicopter owned by Indonesia that applied to transport Indonesia first president, Ir. Soekarno, can be seen at Museum Angkut (the Transportation Museum –Batu Malang, East Java). The president’s helicopter ride for the first time was on January 15, 1951. Now, the original of this helicopter Hiller 360 made in USA is becoming a part of the collection at the Air Force Aerospace Center Mandala Yogyakarta. It looks a bit small ! looks like a real one. That is a small one! Nice that it's in a museum for everyone to see.